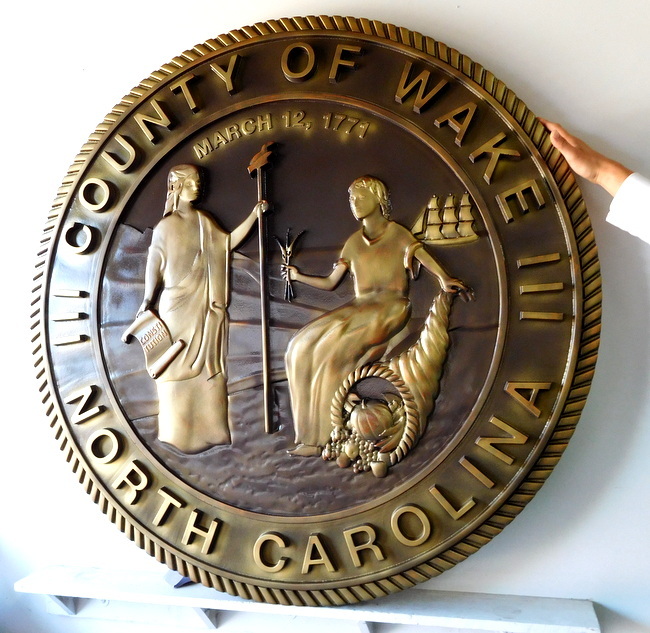 Above is a photo of a bronze-coated 3D carved HDU wall plaque of Seal of the County of Wake in North Carolina. The text and art on this plaque is hi-polished bronze and the background is dark patina. The artwork is the same as the Great Seal of North Carolina. We make custom & personalized metal and metal-coated round, rectangular, shield, and other shape wall plaques of all of the great seals, emblems, logos, badges, medals, insignia, and patches for any branch, department, agency or other organization of the US Federal, State, county and city governments and their various departments, agencies, etc.,(especially courts), as well as professional offices (attorneys, doctors, CPAs, etc. ), colleges, companies, stores, cemeteries, memorials, churches, and residences. We can make a 2.5D (flat relief) or 3D carved and sculptured bas- relief (1/2 to 1 1/2 inch elevation relief ) metal-coated High-Density-Urethane wall plaque of any design in any size from 12 inches to 8 feet, for either indoor or outdoor use. Typical sizes are 18 , 24, and 36 inches in diameter. Metal coating types include bronze, brass, copper, silver-nickel, aluminum, stainless steel, gold, and silver (the latter two are leaf gilded rather than liquid metal coated).